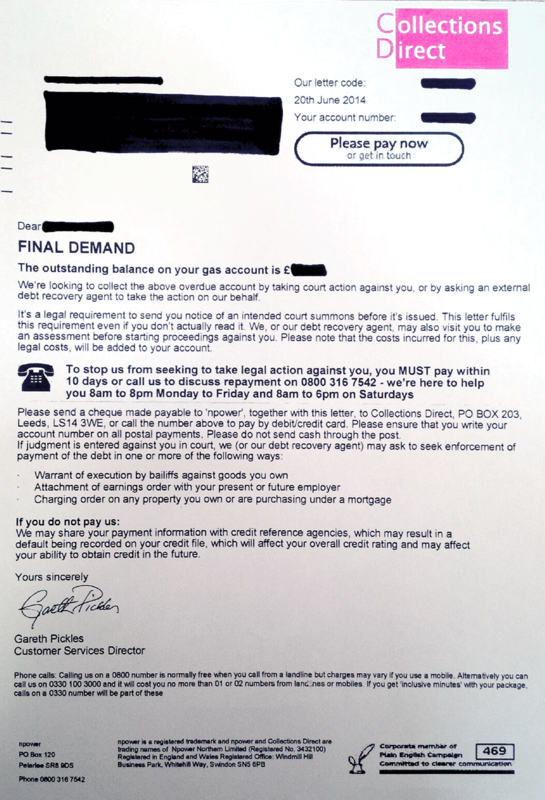 Npower customers are the latest targets of fake debt collection company letters – but the energy giant says it won't stop using this fictitious 'firm' to recoup money it's owed. One former customer received a final demand from "Collections Direct" 16 months after they'd switched away, threatening legal action and bailiffs if they didn't repay the amount owed within 10 days. But while the letter's layout makes it look like it's from an outside debt collector, the small print at the foot reveals Collections Direct is just a trading name of Npower. There is no Collections Direct listed at Companies House, and when MoneySavingExpert.com rang the number given in the letter, it went straight through to Npower. Npower won't tell us how many letters in total it's sent out, but it admits Collections Direct is part of its "internal collections process", which it uses once "it's exhausted all other methods" – meaning other methods of getting in contact have failed on four previous occasions. "It is clear from the content that Collections Direct is very much part of our business," it says. It adds that the letter is signed by its customer services director, Gareth Pickles. However it only states Pickles' name and role, making it sound like he's the customer services director of Collections Direct, not Npower. The energy firm says it has no plans to stop using the letters. The news is the latest in a number of scandals Npower has been caught up in. Last month it was revealed that former customers received huge bill demands months after they'd switched provider (see the Npower late bill blunders MSE News story). Here's a copy of a letter received from a MoneySavingExpert.com user (click to enlarge). Yesterday, the Student Loans Company came under fire from the Government after it was found to have sent graduates letters purporting to be from a debt recovery firm called "Smith Lawson & Company". MoneySavingExpert.com's campaign manager Wendy Alcock says: "It's not surprising to see another complaint about Npower's dealings with its customers. This is yet another example of how the energy provider needs to sharpen its game. "While not as misleading as some of the other poor debt collection practices we've seen in the last few weeks, the fact that this is a debt being chased by Npower for Npower is not clear." If the debt recovery firm is actually just a trading name or part of the firm you owe the debt to, look for clues on the letter you receive. In this case, it was at the foot of the letter. An Npower spokesman says: "Npower does send letters from 'Collections Direct' as part of the internal process to ask for payment, however letters clearly state that 'Collections Direct' is a trading name of Npower and includes Npower's registered office details, and is signed by the Npower Customer Services Director. "Npower is not stated to be a client of Collections Direct or that the account has been 'passed to' Collections Direct. "It is clear from the content that Collections Direct is very much part of our business and the letter is signed by the Npower Customer Services Director and the first line says very clearly that the debt has not yet been passed to an external debt recovery company."